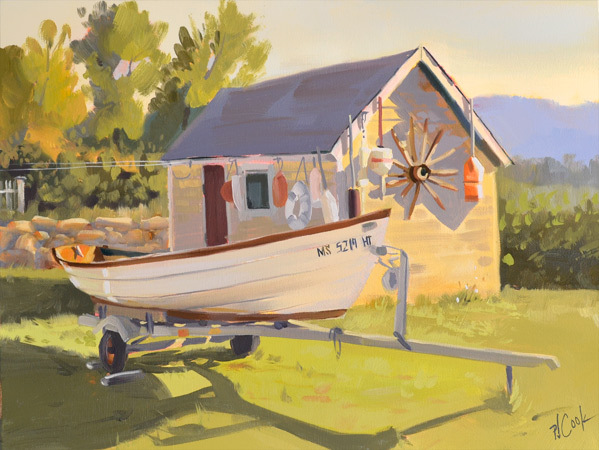 Waterside Collection is a landscape painting of a Martha’s Vineyard island yard with a small boat and a shed with a collection of lobster buoys. Even though there is green grass you can almost smell the ocean air. A small wooden boat is on a trailer ready for the water. A wide array of lobster buoys are hanging on the side of the shed. The scene was lit by the midday sun that created strong shadows. Too tempting of a scene to pass up. Waterside Collection, 11 x 14 oil on canvas, ©2019 PJ Cook. Artist Notes: This Waterside Garden painting is an original work of art by PJ Cook. Oil on canvas 11″x 14″ size. Sold framed. Professional materials used throughout. Signed by the artist front and back. All purchased artwork is carefully wrapped and packaged for shipping. Most artwork is shipped one day after payment unless otherwise stated. Sometimes the oil paint is still drying and cannot be shipped immediately. But most of the paintings are ready to go. There is a full refund within 14 days of purchase. Thank you for your interest in my original art and please contact me with any questions.